Geometric Nails for the #31DC2016Weekly - Polish Etc. 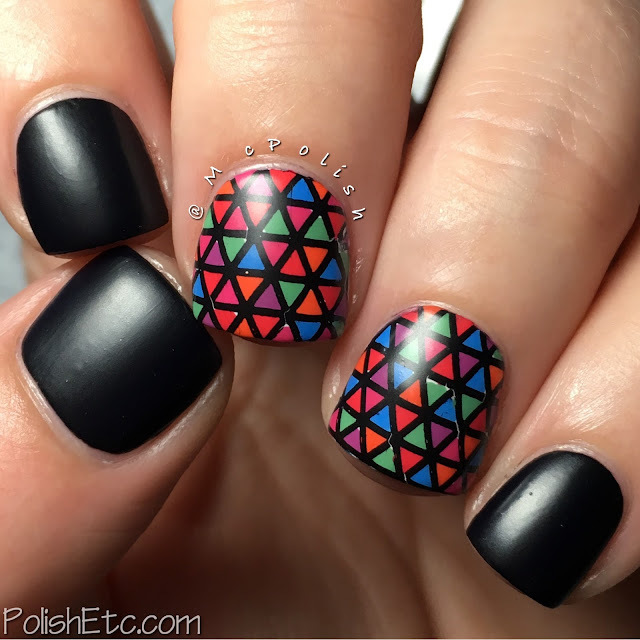 It is week 16 of the #31DC2016Weekly and we are doing nails inspired by geometric patterns. I decided to use a fun stamping image from UberChic that is sheet of triangles. Triangles are my favorite shape, three points where two lines meet (bonus points if you know that lyric, if not you can check it out here). I really liked how this mani turned out except for one thing. I should have used a black base under my stamping instead of white. You can see the small defects up close but in real life it isn't obvious. Check out my little mini advanced stamping tutorial at the end of this post! All of the polishes used in this mani are from my favorite mainstream brand, Zoya. The black creme is Zoya's "Black Swan" and the triangles are all 6 colors from the new Sunsets Collection. I have plans to swatch the Sunsets and Seashells collection for you all if you would still like to see them. I topped this off with Zoya's Glossy Seal top coat. Of course, I had to see what this looked with mattified and I love it! I used Zoya's Satin Seal Top Coat to give my mani a soft, satin look. Which version do you like better? So here is a little look at how I created the stamp on my two middle fingers. I colored in my stamp directly on the stamper. Then I applied a very thin, dry brushing of clear polish on my already painted and dried white base. I stamped the colored in stamp directly onto the nail then cleaned up the edges. I like to clean up before applying a top coat because the extra bits of stamp and curl over onto the top coat and ruin things. Some people prefer to cover stamp with a clear coat and make a decal. It is all personal preference. Making the decal would have probably worked better here since I allowed this to dry to long and it cracked a little during application (as you can see with the small white defects). Not perfect but not wretched. I hope you liked this manicure because I sure did. It's edgy and graphic. I also love Zoya polishes. They always perform beautifully. Let me know if you want to see this Sunsets Collection swatched on it's own. 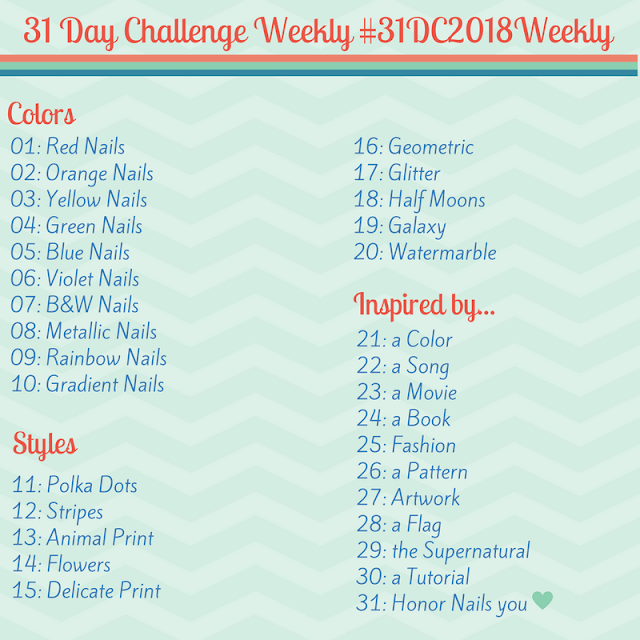 Be sure to check out the other ladies joining in on the challenge by checking out the #31DC2106Weekly tag on Instagram, Twitter and Facebook. Join in anytime you would like, we are in the second half of the challenge. How do you get your decals so perfect? ?